Wholistic Peace Institute presents a fundraising dinner to support the Torah for Justice, Torat Tzedek. Rabbi Arik Ascherman is internationally recognized as a leading advocate for human rights and social justice in the Middle East. He is the Founder & Director of Torat Tzedek and the former Director of Rabbis for Human Rights – the largest human rights NGO with over 300 rabbi members, in the Middle East. He is a Harvard Graduate and received his Rabbinic Ordination at Hebrew Union College – Jewish Institute of Religion. Having sustained beatings and stabbings, and bravely arguing land use cases in front of the Israeli Supreme Court, he has managed to survive extremely taxing and dangerous work, and continues to exhibit resilience for peaceful, non-violent resolution of these decades long conflicts. Wholistic Peace Institute presents a fundraising dinner to support the Torah for Justice, Torat Tzedek, an NGO that defends the human rights of all Israelis and those under Israeli control, advocating for Palestinians, socioeconomic justice for Israelis, African asylum seekers, and Israel’s Negev Bedouin citizens. 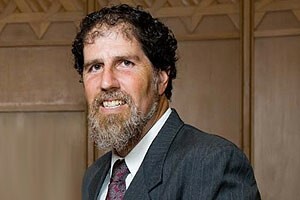 Rabbi Ascherman is a well-known leading human rights advocate and symbol of hope to many Israelis and Palestinians. The lecture and dinner is in conjunction with the 10th Annual Harold Schnitzer Spirit of Unity Awards brought to Oregon by Educating for Peace, the Wholistic Peace Institute. This Student Peace Leadership Program awards and recognizes middle and high school peace clubs for their important work in our communities and brings international and national human rights experts into our Oregon School System. Come hear Rabbi Ascherman explain how “in the human rights field we must have one foot in the grassroots and the other among the decision and opinion makers.” Field work provides the necessary knowledge and moral voice for being able to successfully go to the courts, the Knesset, the public, the international community, and/or to the press. He will explain the tactics he is effectively using to move toward equitable outcomes and social justice in the region and why it is important to teach about human rights in the schools today.